In 2015, according to the Postal Service, San Diego and Los Angeles were once again among the top ten cities in the nation for dog bite attacks. More than four million dogs bite people in the U.S. every year, and about half of the victims are small children. If you or your child suffers a dog bite in southern California, you must obtain medical treatment at once. The potential ramifications of a dog bite include rabies, lacerations, muscle and tissue damage, and disfigurement. Once you’ve seen a doctor, arrange to see experienced Riverside dog bite attorney Chris Purcell. Thirty-four people died from dog bites in the United States in 2015. Dog owners must act to keep others safe, and parents must teach children to avoid unknown dogs and to be careful around any dog. If you’ve been injured – or if your child has been injured – in southern California by a biting dog, speak at once with Riverside personal injury attorney Chris Purcell. He can help. WHAT ARE THE COMMON TYPES OF DOG BITE INJURIES IN RIVERSIDE? Besides these physical wounds, dog bite victims can also suffer emotional pain. This is especially common in children, who tend to have more severe mental reactions to dog bites than adults, and victims who have disfigurement or scarring as a result of the dog bite. If a child is already fearful of dogs, a dog bite can exacerbate this phobia for years down the road. If you or a loved one has suffered injuries in a dog attack, speak to attorney Chris Purcell as soon as possible. You may be entitled to compensation for your pain and suffering, so it’s imperative that you meet with Chris Purcell for a free legal consultation. After you have been bitten by a dog, it’s imperative that you seek medical attention as soon as possible. This is especially important if you plan on seeking compensation from the dog’s owner, since you will need medical documentation to prove the extent of your injuries. Even if you don’t think the bite is serious, you should seek medical attention. Dog bites often lead to infections, so always treat wounds immediately after an attack to prevent medical complications. Be sure to take photographs of your injuries on the day of the attack and everyday after to document their progression. In fact, you should take pictures of as much evidence as possible, including bloody clothes and the location of the attack. Jot down the pain you are experiencing in a journal on a daily basis. Dog bite injuries often take weeks to heal, so having this record will help you prove the seriousness of your injuries. Once your injuries have been properly treated, you must file a California dog bite report with the proper authorities—either with your city or county. If you don’t take this step, there will be no official report that proves you were actually bitten. Try to find out if the dog has a prior history of attacking people, or if you were the first. It’s also important that you identify the owner of the dog and get his or her contact information so you can hold him or her responsible. Finally, contact an attorney as soon as possible. Personal injury law can be complex and confusing, so you should never try to receive compensation for your injuries without the help of an experienced attorney. Call Chris Purcell today for a free legal consultation so you can get started fighting for the compensation you deserve. HOW CAN A RIVERSIDE COUNTY ATTORNEY HELP DOG BITE VICTIMS? With Chris Purcell negotiating on your behalf, a dog’s owner may have to compensate a dog bite victim for medical costs, days lost from work, pain and suffering, and all other injury-related expenses and damages. If a settlement cannot be negotiated, Chris Purcell will take your claim to a jury of your peers, and he will ask that jury to find the dog’s owner negligent and to compensate you fairly and fully. WHEN CAN ATTORNEYS HOLD A DOG’S OWNER ACCOUNTABLE FOR YOUR INJURIES? Under this state’s personal injury laws, a dog’s owner is considered “strictly” liable and is not required to have prior knowledge of a dog’s aggressive behavior. California thus makes it easier for dog bite victims to be compensated than states with the “one-bite” rule. The only exception would be if the victim was cruelly provoking the dog prior to the attack or if the victim was trespassing on private property at the time of the attack. In these situations, the owner would not be held liable and the victim would not be entitled to compensation. Dog bite injuries are quite painful. Skin grafting, reconstructive surgery, and months of rehabilitation are sometimes required, leading to massive medical bills that you should not have to pay without compensation from the liable party. 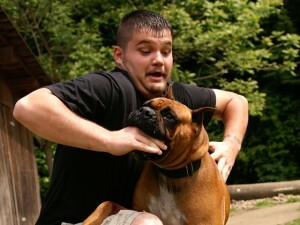 Chris Purcell can fight aggressively on behalf of dog bite victims and their families when a dog owner’s negligence is the direct cause of a dog bite injury. Of course, anyone who suffers a dog bite while intentionally provoking a dog, trespassing, or committing a crime in southern California probably will have no legal grounds for a personal injury claim. To discuss your dog attack claim, seek representation from Chris Purcell as soon as possible. Attorney Chris Purcell has the skill and experience to challenge insurance companies that routinely underestimate the cost of dog bite injuries, and he represents clients throughout the Inland Empire region and across southern California. He has experience representing people in cases involving dog attacks, motorcycle accidents, slip and fall accidents, premises liability, bicycle accidents, pedestrian accidents, truck accidents, and construction accidents. Clients pay no fees unless and until Purcell Law recovers damages for you. To arrange a free consultation with Riverside dog bite lawyer Chris Purcell, call our law offices at 714-332-5098 or contact Chris by email today.